Your drive gearing and rear cassette are an important part of your wheel set-up. Nimble wheels support both Shimano and Campagnolo (Campy) drive configurations (see hub configuration). 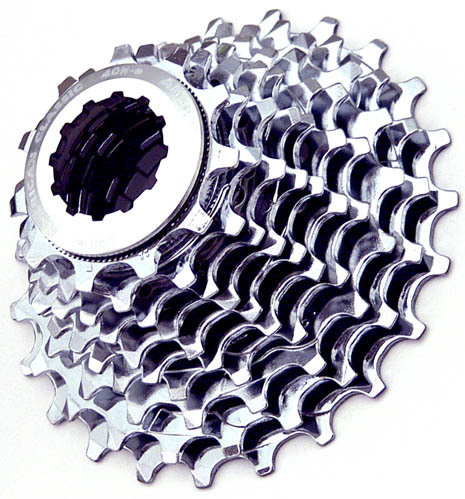 We carry Shimano, Campy and third party cassettes in our Race Ready Program. The technical data on cassette choices are arranged below by drive type. Shimano. The Shimano style cassette spline accommodates 8, 9 and 10 speed cassettes (130mm rear hub spacing) and with spacers, it also accommodates 7 speed configurations (126mm). In 9 speed, Nimble carries Dura Ace (with 3 or 4 ti cogs) and Ultegra (with all steel cogs). Here are tech data on the configurations we stock on hand. If you do not see what you are looking for, contact us, we can ship most requests within a few days. Weights below are measured on our precision chemistry scale. 2Steel 11-32 is XT mountain bike. Campy 10 Converters. These cassettes convert Shimano 8/9 standard spline hubs to Campy 10 speed (130mm rear hub spacing). 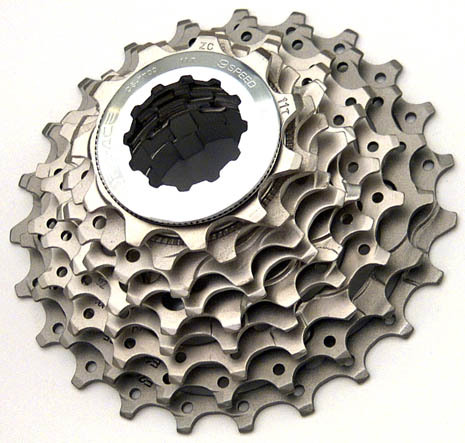 They are 100% compatible and accommodate the 10 speed 36mm cassette width. If you have questions about installation, contact us. These cassettes have steel gear teeth with alloy carriers under the largest gears, making the total weights satisfactory. 4Cassettes listed have steel cog teeth with alloy carriers. Campy. The Campy style cassette spline accommodates 8, 9 and 10 speed cassettes (130mm rear hub spacing). Nimble carries a limited number of these cassettes on hand but can provide a broad range of choices within a few days. If you don't see what you need, contact us.